An air compressor is a great tool to have in your home or garage. Whether you’re a seasoned craftsman or you’re just starting to learn your way around a workshop, compressors can prove to be a very useful tool to have at your disposal. They’re incredibly versatile and can be used for a wide range of projects. Many people make the mistake of thinking that air compressors are out of their wheelhouse. They’re typically associated with auto shops and heavy industrial settings. 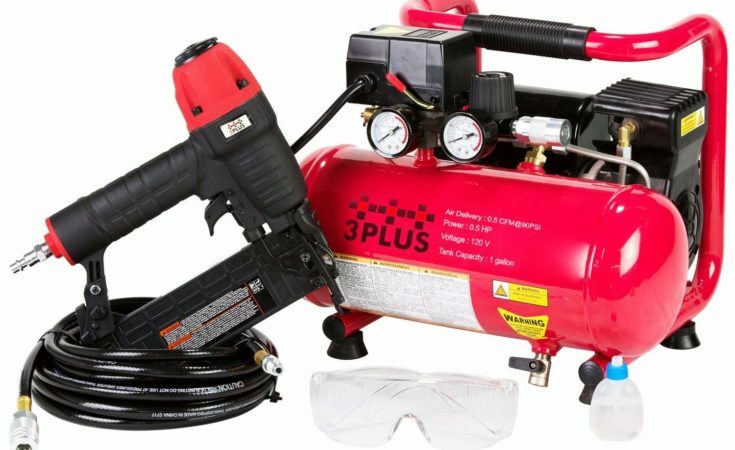 In reality, air compressors can be used to improve your efficiency and technique for furniture-making, arts and crafts projects, home improvement jobs, and so much more. These pieces of equipment power pneumatic tools. As a result, the possible uses for an air compressor are endless. With that being said, not all air compressors are made the same. These tools are notorious for being loud and cumbersome. In fact, many people who work around air compressors for prolonged periods of time have to wear ear protection for safety. Needless to say, having a loud air compressor in your home or small workshop is not exactly ideal. Luckily, quiet air compressors do exist. 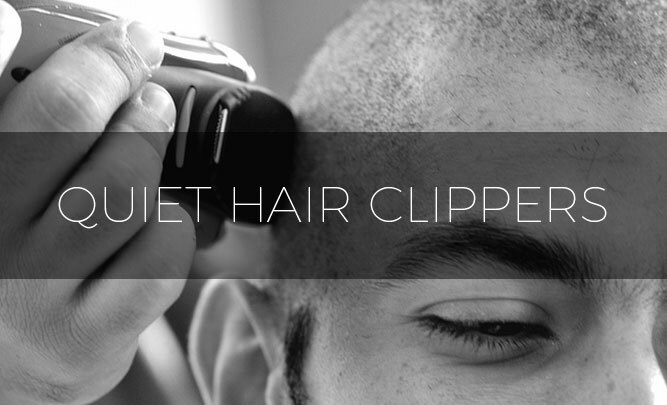 They’re specifically engineered to produce less noise. Quiet air compressors can provide you with the same power and versatility as a standard model without all of the noise and hearing concerns. There are many products on the market to choose from. To help you find one that’s right for your needs, here is a list of some quiet air compressors that you should take a look at. This compressor from 3PLUS is portable, easy to use, and very quiet. It has a decibel rating of only 65. It features an oil-free motor for easy maintenance. The compressor has rubber feet for stability and a durable metal handle for transport. It produces about 0.7 CFM at 90 PSI. However, the PSI can be adjusted to your needs. You can set the compressor to achieve a maximum PSI of 125. The kit comes with a matching brad nailer and a 25-foot hose. With its bucket-style pancake design, this compressor from Campbell Hausfeld is very compact. It features a metal handle and a rubber grip for easy transport. The compressor features a dual-piston pump for maximum efficiency. 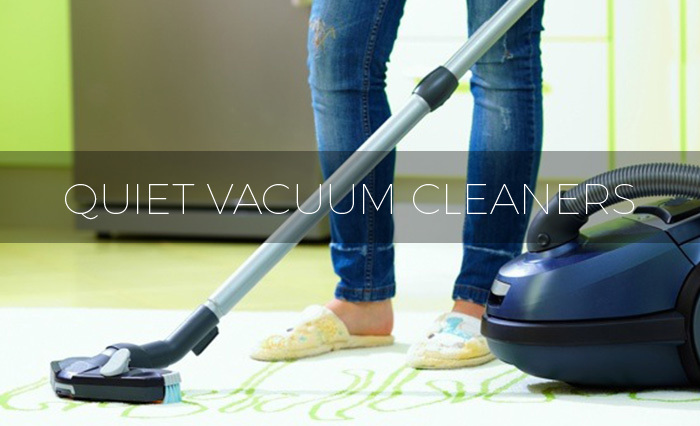 It’s powered by an oil-free motor that’s engineered for longevity and ease of use. The compressor has a large, 6-gallon storage tank. It also has 2.4 CFM at 90 PSI. When it comes to noise, this compressor produces about 68 decibels, which is far below the quiet threshold. With an output of only 60 decibels, you will quickly forget that this air compressor is running in the background as you work. It features a powerful, 1-horsepower motor. The motor is an oil-free model, so you don’t have to worry about constant maintenance. 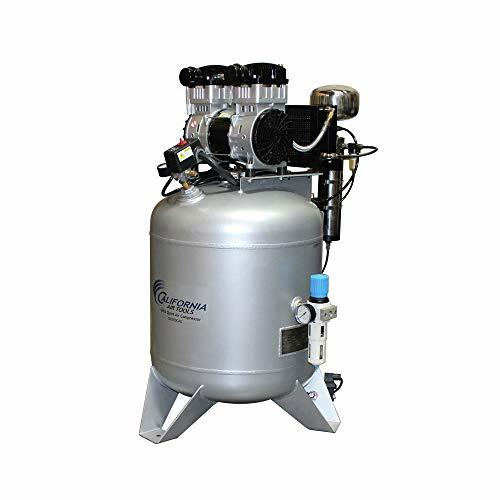 The compressor features a large, 8-gallon storage tank. The tank has two wheels and a simple handle for portability. When it comes to PSI and CFM, this model allows you to change the settings based on the job. It has 3.0 CFM at 40 PSI and 2.2 CFM at 90 PSI. This compressor is very similar to the previous option. It’s even made by the same company. However, it features a more powerful motor and a larger tank. The 10-gallon air tank provides you with plenty of work time. The 2-horsepower, oil-free motor also fills the tank much faster. 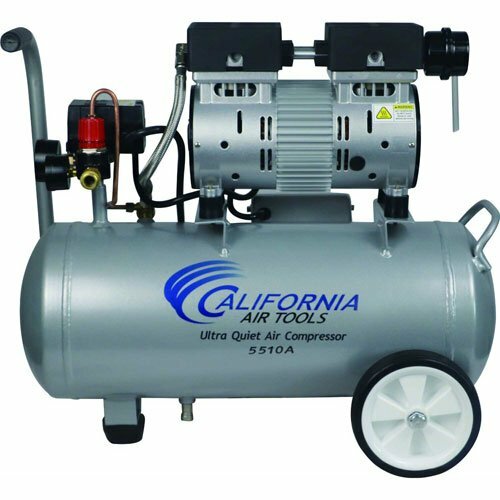 Another great option from California Air Tools is this ultra-compact air compressor. It is very small and portable. The small, 1-gallon storage tank cuts the overall weight of the compressor down while also minimizing its footprint. 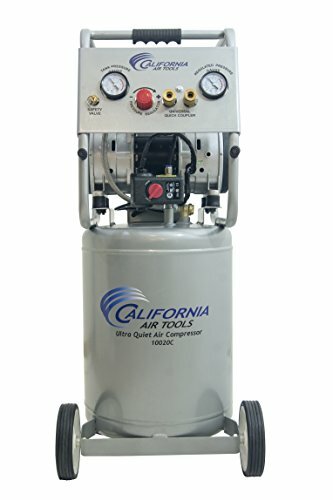 Like the previous California Air Tools compressors, this one also features an oil-free motor. It uses a 1.5-horsepower motor for quick filling and effortless operation. When it comes to sound output, this compressor generates an impressive 56 decibels. 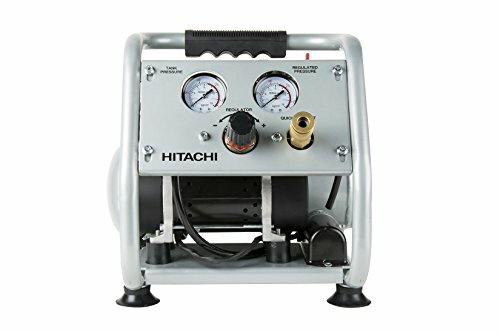 If you need a quiet compressor that you can take with you on the go, this option may be for you. It only weighs approximately 25 pounds. The small tank can hold 1 gallon of pressurized air. The entire unit is constructed to be as small as possible. Both the tank and the motor is welded onto a sturdy frame that doubles as a carrying handle. The motor is oil-free for easy maintenance. The compressor also has some convenience features. There’s an industrial quick coupler that makes switching out hoses a breeze. The PSI and CFM can also be adjusted with a regulator knob. 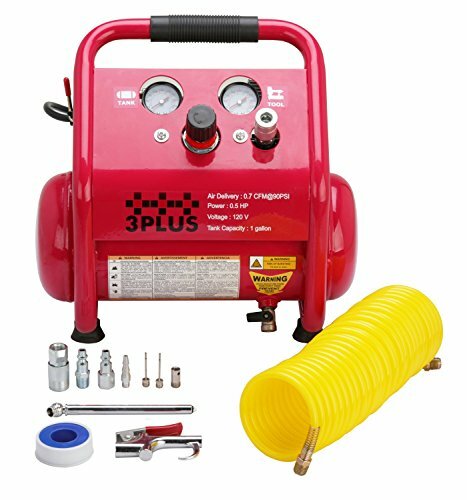 This air compressor kit from 3PLUS has all the accessories you need to get started. 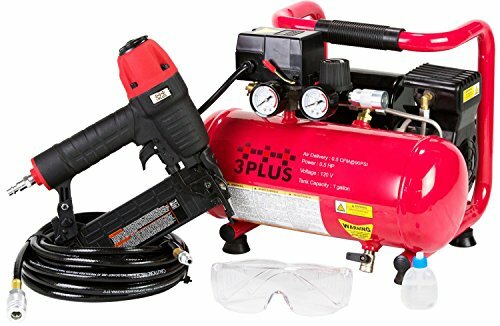 In addition to the portable compressor, it comes with a hose, air gun, and a collection of other extras. The compressor itself is quite small. It has a 1-gallon storage tank and a small, oil-free motor. All of the components are attached to a single frame for easy transport. On the front of the motor, you’ll find the hose connection and a knob for easy pressure adjustments. It has a maximum PSI of 125. However, at 90 PSI, the CFM rating is 0.7. The compressor is very quiet, producing only 65 decibels of sound. Take a stroll through your local home improvement store and you’ll quickly see that air compressor designs are plentiful. These machines come in all shapes, sizes, and configurations. It’s important that you put some thought into your purchase. Instead of grabbing the cheapest option you see, you should consider a number of different factors. Taking some extra time to choose a quiet air compressor that’s right for your needs can help you save time, money, and headaches. Here are some things you should be looking for on your hunt. Many people assume that all air compressors use the same type of motor. Unfortunately, this often leads to buyer’s remorse. There are a few different types of motors available. While they all do the job they’re designed to do, some motor designs are better suited for specific types of jobs. Before we start examining the differences between the motors, it’s a good idea to familiarize yourself with what the motor does. The motor in your air compressor is what provides you with the pressure you need to make your tools work. When a compressor is first turned on, the motor will force air into the holding tank. More and more air is forced into the tank until the pressure increases to the upper limits of the tank. Then, the motor shuts off until the air pressure in the tank decreases. Air compressors powered by gasoline engines are the most powerful. They’re frequently used in industrial applications. If you’re seeking a quiet air compressor, these types of motors should be avoided. 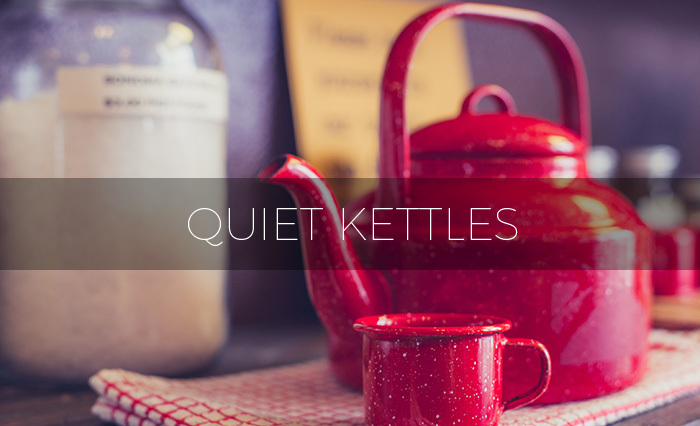 They’re not particularly portable and tend to produce a lot of unwanted noise. As the name implies, these motors use a series of rotating magnets to create a strong magnetic field. Magnetic motors are relatively quiet, especially when compared to gasoline-powered compressors. Furthermore, magnetic options tend to require less upkeep than other alternatives. Oil-free motors have grown in popularity in recent years because of how easy they are to use. These types of motors utilize pistons and valves to create air pressure. While they don’t require oil changes, the name is a bit misleading. Oil-free motors do contain some oil. However, the components within the motor are pre-lubricated at the factory and contained within the motor so that you don’t have to do a thing. 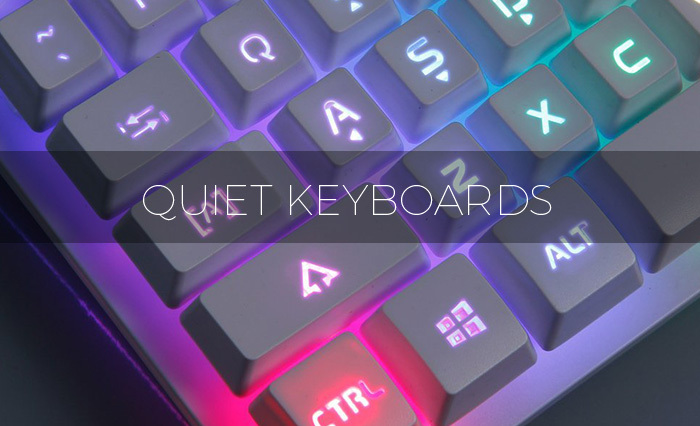 They’re also significantly quieter than other options. If the sound level is important to you, consider an oil-lubricated motor. These compressors utilize thick oil to regulate temperature and reduce friction. As a result, sound levels are significantly decreased. The only trade-off is that these motors require much more maintenance than their oil-less counterparts. You would need to keep the motor clean and change out the oil regularly. However, once you get the hang of things, these types of compressors can last for many years to come. Compressors with this type of motor have a rotating wheel and a belt. These motors are typically reserved for larger air compressors because they take up a lot of room and can provide you with a lot of pressurized air. 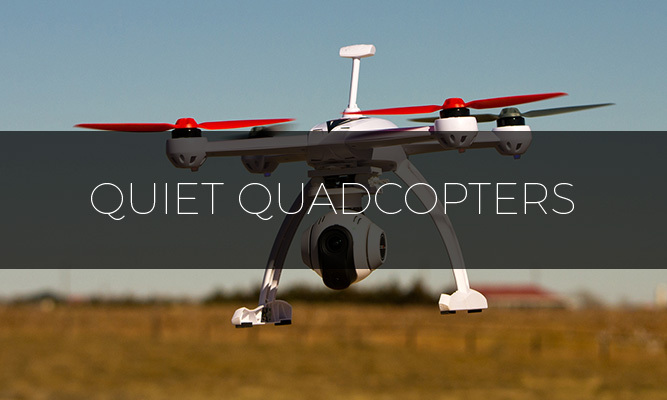 In terms of sound, they’re quieter than standard motors or gas-powered equipment. However, they’re noticeably louder than oil and oil-free models. When you’re checking out air compressors, take a look at its decibel rating. Many manufacturers make this information readily available. 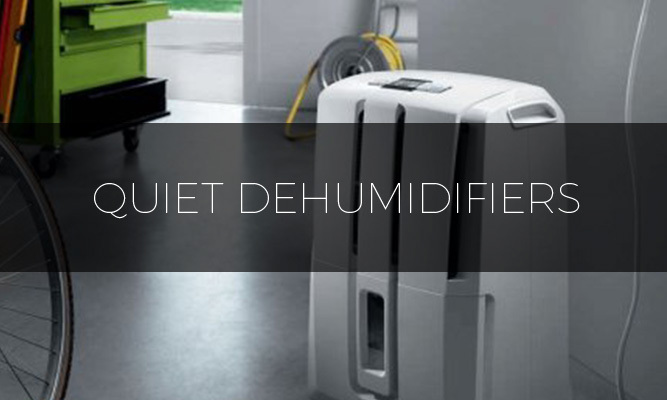 If the product is advertised as a quiet air compressor, the decibel level it produces is most likely advertised. To be classified as a quiet air compressor, the machine has to generate less than 80 decibels of noise. You can easily find options as low as 60 decibels. To give you some perspective about the noise levels you can expect, 60 decibels is equivalent to normal conversation. It’s also as loud as a standard air conditioning unit when you’re standing approximately 100 feet away. If you’re looking to bring the decibel level down even further, you have a couple of different options. Many portable air compressors have an isolated rubber chamber around the motor. This cuts the noise significantly. Alternatively, you can search for a unit with built-in sound mufflers. How dedicated do you plan on being when it comes to maintenance? Some units, such as oil-free models, are virtually stress-proof. They require no major work to maintain. Oil-lubricated models, on the other hand, require regular maintenance. It’s an important thing to consider, as failing to provide adequate care to an air compressor can lead to damage and poor performance. Compressors can come with tanks of varying sizes. The tank is where the pressurized air is stored. Naturally, a larger tank will provide you with more work time. They can also be used with multiple pneumatic tools at one time. However, they take a lot longer to fill and require more space. On the opposite side of the spectrum, small tanks are great for portability. But, your supply of air can be used up quite quickly. When you’re trying to decide on tank size, think about how the air compressor will be used. If the machine is something you plan on using for big jobs, larger tanks are always better. For those who plan on using the compressor for DIY projects and tinkering, a small or medium-sized tank should be just fine. Now, let’s get into some of the technical details. There are two main ratings you need to pay attention. These include the CFM rating, or cubic feet per minute rating, and the PSI rating, or pounds per square inch rating. The CFM rating is an important number that refers to how much air a compressor will be able to supply when it’s in use. It’s a measure of airflow. A higher CFM rating means that you will get more air. Generally, a CFM rating below 5.0 is ideal. For light, everyday work, 3.0 should serve you well. However, if you plan on using multiple tools at one, it’s a good idea to get a compressor that’s closer to 5.0 CFM. The PSI and CFM rating go hand in hand. The CFM rating is directly correlated to the PSI of an air compressor. It refers to the amount of air pressure a compressor and its respective tank can handle. The most common PSI rating you’ll see is 90. This is the magic number that most manufacturers stick to. There are other ratings available, but 90 PSI is great for most applications. If you need even more versatility from your air compressor, you can easily find models that offer variable PSI and CFM ratings. They allow you to adjust the machine to fit your particular tools and needs. Q: Is there such a thing as a silent air compressor? A: While many compressors are labeled as “Quiet” or “Ultra-Quiet,” there’s no such thing as a silent compressor. These machines will produce some level of noise. As mentioned earlier, there are ways you can minimize it. Many people work a considerable distance away from the compressor. Doing this helps to cut the relative noise level so that you can concentrate on your work. 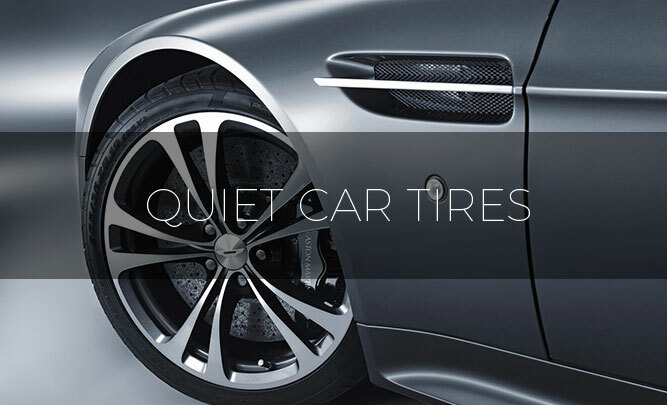 Q: What can quiet air compressors do? A: Quiet air compressors can do the same things that standard models can do, which is a lot. Compressors are very handy machines that play an important role in many different industries. They can serve you well when you’re working on your car, when you’re painting, when you’re woodworking, and so much more. The reason that air compressors are so versatile is that they provide power to pneumatic tools. The air pressure created by a compressor can drive nails, spread the paint evenly, and provide more torque than battery-powered tools. Q: Are quiet air compressors safe? A: When they’re used correctly, air compressors are very safe to use. Quiet compressors are a bit safer due to their low decibel level. 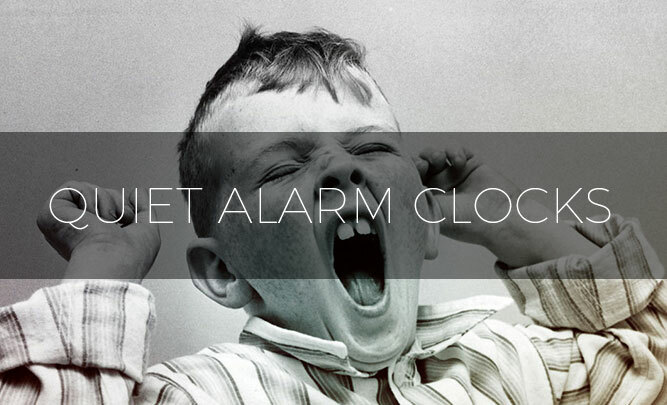 Noises above 85 decibels can be harmful to you when you’re exposed to it for extended periods of time. 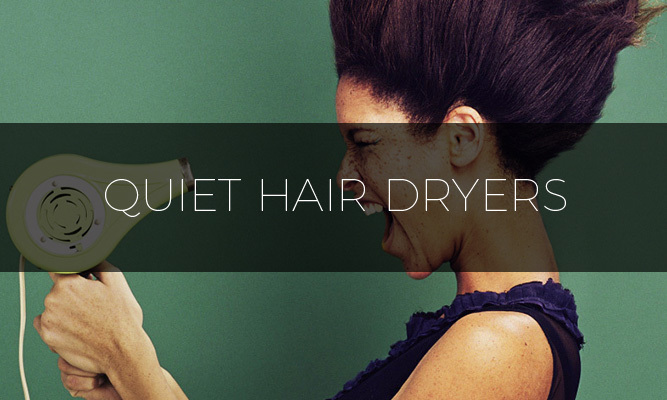 Because quiet air compressors produce less than 80 decibels of noise, that’s not something you have to worry about. While they’re generally safe, air compressors can be dangerous if they’re not maintained properly. One of the most common issues that air compressors face is leaking oil. If oil gets into the tank and is exposed to high amounts of pressure, it can cause an explosion. Needless to say, proper maintenance is crucial! This is why oil-free models have become so popular. You don’t have to worry about oil leaks. Q: What makes an air compressor different from other tools? A: Many experienced workers choose to use air compressors instead of tools powered by batteries or electricity. This is because pneumatic tools are much more powerful and very cost-effective. 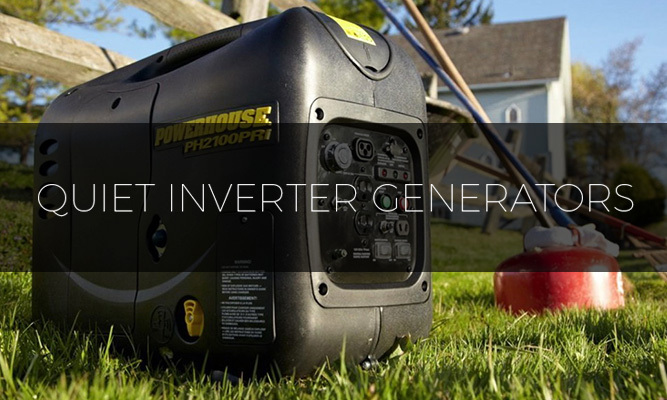 With an air compressor, you don’t have to worry about putting batteries on the charger. The only electricity you’ll use is from the motor, which is considerably less than a tool you have to plug in. Not only that, but most pneumatic tools cost a fraction of what their battery-powered counterparts do. This is because there are no electrical components inside. They’re much cheaper to manufacture, so those savings are passed on to the consumer. Q: Do quiet air compressors need additional accessories? A: Beyond the oil and other maintenance tools, the only additional accessories you’ll need are the tools and the hose. Hoses are quite affordable and come in a range of sizes to suit your needs. You can also get automatic winders to keep your shop organized or couplers to use multiple tools at once. Q: Are quiet air compressors portable? A: Many models are portable. It’s not uncommon to see air compressors attached to a dolly-like frame. A set of wheels make it easy to move to your work site. Portability features are usually reserved for models with a medium-sized tank. If you have a large tank, it will have to stay in one spot.